For the first time, scientists from the University of Cambridge have created cerebral cortex cells from a sample of human skin. The scientists were able to generate the cerebral cortex cells by taking skin biopsies from patients and then reprogramming the cells from the skin samples back into stem cells. They believe this research will lead to a better understand of developmental conditions and neurodegenerative conditions such as Alzheimer’s. Cambridge scientists have, for the first time, created cerebral cortex cells – those that make up the brain’s grey matter – from a small sample of human skin. The researchers’ findings, which were funded by Alzheimer’s Research UK and the Wellcome Trust, were published today in Nature Neuroscience. Diseases of the cerebral cortex range from developmental conditions, such as epilepsy and autism, to neurodegenerative conditions such as Alzheimer’s. Today’s findings will enable scientists to study how the human cerebral cortex develops, how it ‘wires up’ and how that can go wrong (a common problem leading to learning disabilities). It will also allow them to recreate brain diseases, such as Alzheimer’s, in the lab. This will give them previously impossible insight, allowing them to both watch the diseases develop in real time and also develop and test new drugs to stop the diseases progressing. For their research, the scientists took skin biopsies from patients and then reprogrammed the cells from the skin samples back into stem cells. These stem cells as well as human embryonic stem cells were then used to generate cerebral cortex cells. “We are really pleased to have contributed funding for this work and the results are a positive step forward. Turning stem cells into networks of fully functional nerve cells in the lab holds great promise for unravelling complex brain diseases such as Alzheimer’s. 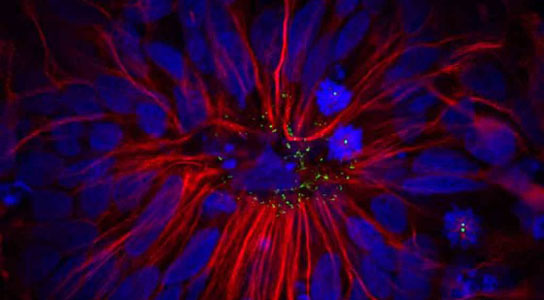 Be the first to comment on "Scientists Create Brain Cells from Skin Cells"